I'm trying to display a long barcode in an email. 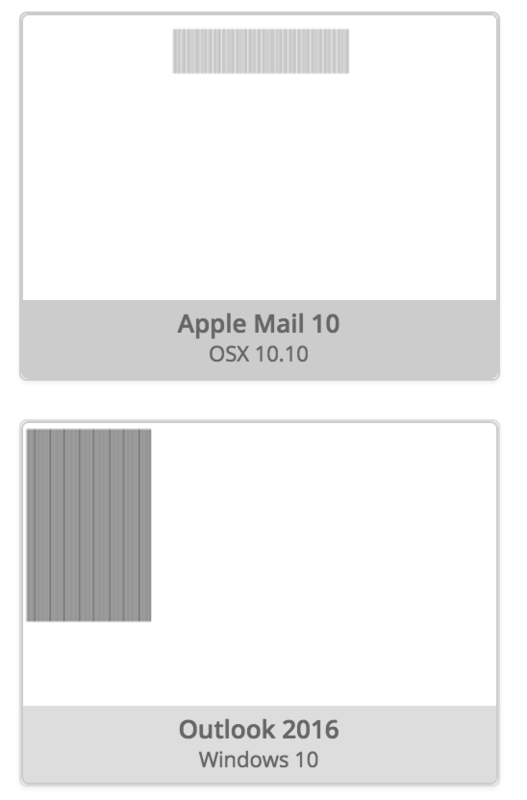 All email clients handle short barcodes (in this format) perfectly however, when the barcode is longer, all Outlook clients ignore the 50px height and instead elongate the barcode. See screenshot. Here is the code used to generate the emails seen in the screenshot Code. I've tried adding line-height, mso-line-height-rule, table height, border=“0”, cellpadding=“0”, cellspacing=“0” etc.. but still no joy. What do I need to change in order for Outlook to maintain the 50px height, no matter the width? Thought to put it here as well. I removed all the inside tables, widths and kept only the outer td's and it works now in Outlook 2016 Version 1802 (Build 9029.2167). Now all you need is another set of td's that seperates the barcode lines with white. Recommendation: Don't use borders, use td with pixel width and give it a background color. also add align="center" this helps to make it run on everything older then Outlook2016. what was the problem trigger? Well from the look of it I would say it was the difrend rendering engine in outlook sometimes you have to write your code with this in mind. I have also noticed that sometimes depending on how complex and nested your tabels are u need to have something in them. cuz other wise there is no hight if there is no content in it. In your code the <DIV>s are maybe stripped away or the css was overwritten. Even if u use a forced "█" it still also have line-hight and other properties with it. use <span> with height width and a background-color is more "save" around the email clients or try to use bitmaps.